Excellent staff and management they are very helpful. Great place to stay, especially for families with kids. Spacious room with all the facilities available. Convenient and easy location to reach out to the main shopping attractions in Dubai like Mina Bazar, Burjuman center, etc. Very friendly service by the staff, Mr Ashant was Outstanding. I will definitely be there again. If you want a vip service pls visit this hotel. The room was spacious, well maintained, elegant and cozy. The rooftop view was breathtaking and the pool was of a good size. The staff especially the men from the reception were very polite, courteous and accommodating. The room is very big The staff was very kind especially mr aswad The free ice cream & coffee is very quiet & nice Recommended & i will stay again. I liked the friendly staff, cleaners, hospitality, and the wonderful location. Sparkling clean facilities, Amazing breakfast with wide variety. Very friendly and caring staff. Nice swimming pool on the roof top. Location is ideal, everything is available in walkable distance. 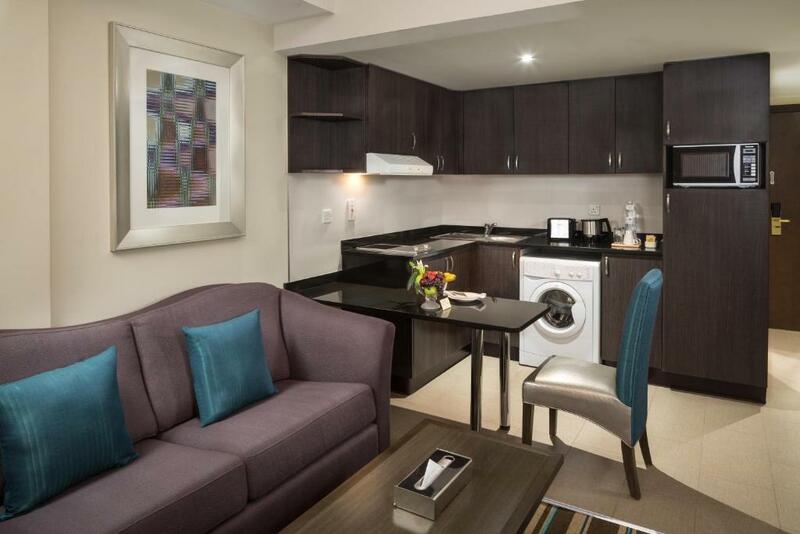 Lock in a great price for Savoy Central Hotel Apartments – rated 8.6 by recent guests! Featuring panoramic views of Dubai’s downtown district of Bur Dubai from the rooftop pool, Savoy Central Hotel Apartments offers apartments with a well-equipped kitchen. Facilities include a health center with a gym. The air-conditioned apartments feature a modern interior with traditional decorative touches. All apartments have a sitting area with satellite TV, a kitchen with an electric oven, and a private bathroom. Guests can relax in Savoy Central Hotel Apartments' health center, which includes a sauna and steam rooms. The tour desk organizes safari and city tours. Savoy Central Hotel’s coffee shop is open for breakfast, lunch and dinner. It serves a wide variety of international dishes. Room service is available as well. The Dubai Museum is half a mile from Savoy Central Hotel Apartments and the Bur Juman Shopping Mall is one mile away. The hotel also offers a shuttle service to Dubai’s beaches. 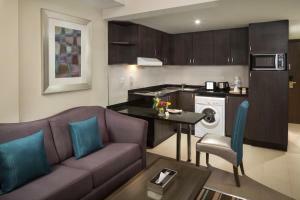 When would you like to stay at Savoy Central Hotel Apartments? All newly renovated and tastefully decorated Studio rooms feature free wireless high-speed internet, a flat-screen multi-channel TV, a seating area with sofa-bed, a full length mirror and an elegant work desk. There is a fully equipped kitchenette with a microwave / toaster / hot water kettle / cooking-ware / washing machine and a large refrigerator. Tea / Coffee / Creamer / Sugar sachets are generously stocked & replenished daily free of cost. An electronic safe locker to store your valuables is available inside each wardrobe with an iron & ironing board. All bathrooms feature a bathtub, hair dryer and are well provided with complimentary toiletries. This room is ideal for a Family of 4 and features 2 large Queen size beds for a comfortable stay. All newly renovated and graciously designed Family Studio rooms feature free wireless high-speed internet, a flat-screen multi-channel TV, a seating area with cozy sofa-bed, a full length mirror and an elegant work desk. There is a fully equipped kitchenette with a microwave / toaster / hot water kettle / cooking-ware / washing machine and a large refrigerator. Tea / Coffee / Creamer / Sugar sachets are generously stocked & replenished daily free of cost. An electronic safe locker to store your valuables is available inside each wardrobe with an iron & ironing board. All bathrooms feature a bathtub, hair dryer and are well provided with complimentary toiletries. Includes 2 elegantly furnished Studio rooms that are inter-connected with an internal door. All newly renovated and tastefully decorated Studio rooms feature free wireless high-speed internet, a flat-screen multi-channel TV, a seating area with sofa-bed, a full length mirror and an elegant work desk. There is a fully equipped kitchenette with a microwave / toaster / hot water kettle / cooking-ware / washing machine and a large refrigerator. Tea / Coffee / Creamer / Sugar sachets are generously stocked & replenished daily free of cost. An electronic safe locker to store your valuables is available inside each wardrobe with an iron & ironing board. All bathrooms feature a bathtub, hair dryer and are well provided with complimentary toiletries. All newly renovated and tastefully decorated Studio rooms feature free wireless high-speed internet, a flat-screen multi-channel TV, a seating area with sofa-bed, a full length mirror and an elegant work desk. There is a fully equipped kitchenette with a microwave / toaster / hot water kettle /cooking-ware / washing machine and a large refrigerator. An electronic safe locker is available inside each wardrobe with an iron and ironing board. All bathrooms feature a bathtub, hair dryer and are well provided with complimentary toiletries. -Free stay for 02 kids below 12 yrs, sharing the existing bed & sofa bed in the same room with parents. -Free breakfast buffet for 02 kids below 12 yrs, when accompanied with 02 paying parents at the coffee shop. Dhow Cruise & free entry to Dubai Museum & Free Sharjah tour. -Free cinema tickets for a family of 04 (for 7 nights stay). This studio features free wireless high-speed internet, a flat-screen multi-channel TV, a seating area with sofa bed, a full-length mirror and an elegant work desk. There is a fully equipped kitchenette with a microwave, toaster, kettle, and a large refrigerator. Tea, coffee sachets are well stocked and replenished daily. A safe is available inside each wardrobe with an iron and ironing board and a hair dryer. The bathroom is stocked with complimentary toiletries. First winner of Dubai Green Tourism Award 2012 bestowed by DTCM – Government of Dubai UAE. 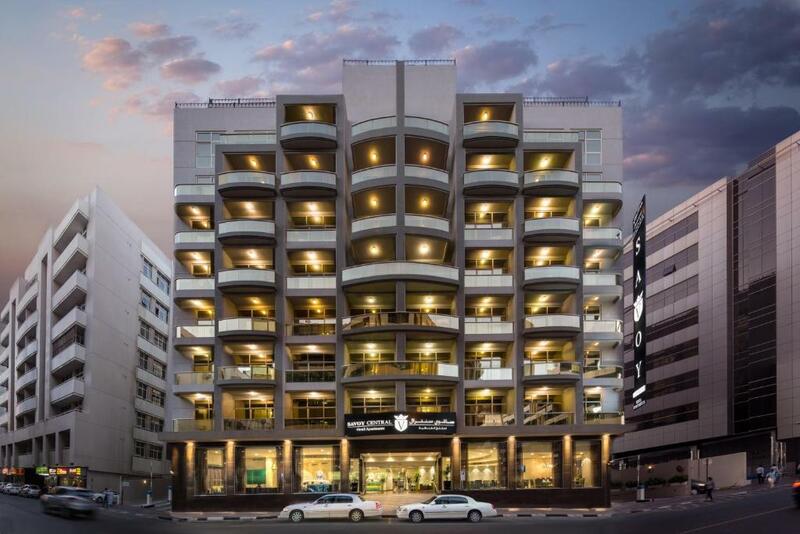 Ideally located in central Bur Dubai behind Computer Street and next to port Rashid. Savoy Central is just minutes from fashionable shopping centers, the gold and textile souks and the business districts of Dubai. Framed by the city’s unique cultural surroundings, the hotel also offers easy access to the celebrated sites of the city. Rich historic sites close to the hotel includes the Dubai Museum, Heritage village, Grand Mosque and the Souks. House Rules Savoy Central Hotel Apartments takes special requests – add in the next step! Savoy Central Hotel Apartments accepts these cards and reserves the right to temporarily hold an amount prior to arrival. The credit card holder must be one of the guests otherwise the booking will be canceled. Please present the same credit card used to make this reservation upon check-in at the hotel. Please note that there might be an early check-out fee subject to availability and rate plan. Please note that upon reservation, the property reserves the right to pre-authorize the guests credit card for the amount of the first night. The extra bed was uncomfortable which later was improved on by adding extra padding underneath the mattress. Decent property with polite staffs. Sofa bed is not a good option, I could feel the springs with two layers of bedding. Water pressure in shower was very weak. Breakfast was very crowded and we had to wait for sometime before finding the place. We really enjoyed our stay at Savoy apartments. The personnel was amazingly nice to us. We were with two children (7 and 9). The room was very big and we had everything to be able to make some meals as it is very expensive in Dubai if you have to go to the restaurant al the time. Nonetheless there were cheap restaurants around and a supermarket next door which was very convenient. The area is more authentic than many places in Dubai and very lively. We used the metro to go anywhere we wanted. The breakfast was very good and had plenty of stuff available. The pool is bigger than we thoughts and the view from the roof is quite nice. Overall, this was an excellent stay for us (we stayed six nights). I can't say I had any problems with the room or service. The hotel is located within walking distance to a mall and plenty of restaurants. The MRT is not far away. The room was very clean and quite. The daily cleaning was very well done, Very satisfied. There are many things I didn't like about the property: - Too noisy, probably not sound proof so traffic noise from outside was really annoying. - Very limited parking, if you come back late then all parkings are occupied. also, parking space is very narrow. - Only 1 bottle of water was provided although it is extremely cheap in Dubai. I don't get this idea of not providing new bottle every day. - Although the room was clean but it's not as good as other hotels. I have stayed in many other hotels but cleanliness is not up to the mark. - Room service timing is really odd. They knock my room every day at 10 which was very annoying. and it's only once a day not twice like other hotels. - when you step out the hotel, its too crowded area. It may be good for tourists who like to stay in crowded area but i don't like it. Staff was good. They explained everything about the facility and welcomed well.